Whether you are looking for a swamp tour or a full day’s event, Cajun Pride Tours can fulfill all your groups needs. Cajun Pride Swamp Tours is an excellent venue for school outings, field trips, church groups, as well as teen and senior groups and family reunions. For groups, we offer Seafood Boils, Barbecue and boxed lunch menus. In addition to swamp tours, we offer city, plantation and combination tours. We also have established relationships with other attractions such as the National D-Day Museum and the Natchez Steamboat which allow us to offer partial, full day and multiple day itineraries for your group. Cajun Pride Swamp Tours features a large parking lot, which comfortably accommodates motor coaches and provides for easy turn around for buses. For your drivers’ convenience, there is a Texaco Fuel Plaza located right next door. Within a short drive you can be at national restaurants such as Pier 51, McDonald’s, Wendy’s and Huddle House or other local eating establishments. Also located nearby are great lodging locations like the Holiday Inn, Hampton Inn, Days Inn and Best Western. 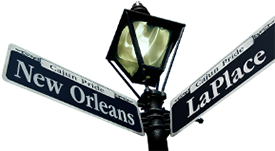 Cajun Pride’s experienced tour guides, helpful staff and group sales department are at your disposal to assist you in making plans. Private tours are available for groups of any size.